Clydebank turned in what was arguably their most dominant performance of the season as they wiped the floor with in-form Troon at Portland Park this afternoon. Jordan Shelvey helped himself to a career first hat trick with Stevie Higgins and Del Hepburn adding one each as the Bankies rattled in five goals for the loss of only one. With Nicky Little and Chris Black still on the injured list, Bankies boss Kieran McAnespie was left with not a lot of options and chose to go with the same 11 as last week and added two of the lads from the Boys Club to bolster the bench. 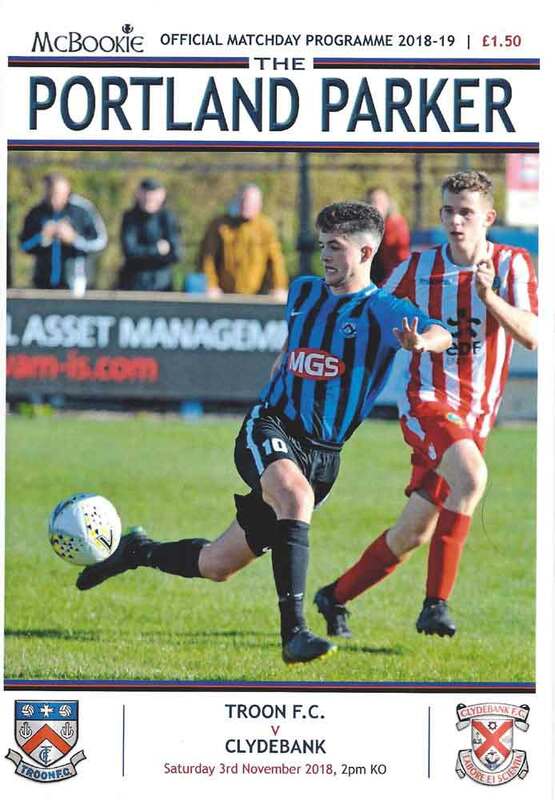 The pitch at Portland Park was in great condition despite all the rain that had fallen in the run up to kick off and it didn’t take the Bankies long to make the most of it. With just six minutes on the clock the Bankies raced into the lead with a superb strike from Del Hepburn. The ball was played into his feet around twenty yards from goal. He took one touch with his left foot to stop the ball, and with very little back lift smacked it into the top corner with his right. Not a lot had happened in the lead up to the opening goal, but after going ahead the Bankies could have had a hatful before half time. With ten minutes gone The Bankies broke out from a Troon corner. Hepburn outpaced Reilly and bore down on goal only to see his shot blocked by Miller. Minutes later a forward ball was superbly flicked past Sherrie by Higgins. The Bankies forward drove towards goal and from an angle shot just wide of the post, when he had a better option to pass inside. The second goal was only delayed by seconds as McClair slipped the ball beyond the Troon defence to Jordan Shelvey on the left hand side of the box. The front man calmly took the ball on his stride and slipped it through Miller’s legs and into the net. Troon woke up after this and McCrea was put through on goal, but Marc Waters was quick off his line to block and then smother the ball at the second attempt. It wasn’t long before the ball returned to the other end of the pitch, however. This time the ball was played into the left channel to Stevie Higgins. Using his strength he forced his way past the defender and delightfully lobbed the goalkeeper only to see the ball come off the face of the crossbar. The luckless Higgins warmed the hands of the Troon goalkeeper with another vicious strike after 33 minutes, and he was just a split second from scoring when Shelvey played a great ball to him inside the penalty box. Miller was quick to react and intercepted the ball in the nick of time. 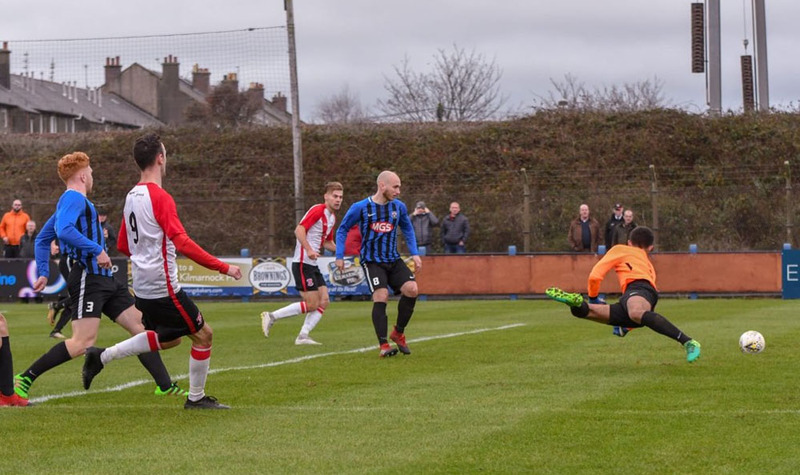 The last thing the Bankies needed as the break approached was be to be pegged back, and with their best move of the match Troon almost made it happen. Nade powered past Fitzpatrick on the right wing and he crossed to the back post where Martin was waiting. It looked like a goal all the way but Waters threw himself across his goal line to produce a superb stop. The Bankies set out to kill the game at the start of the second half and were rewarded after 52 minutes. Cammy McClair played a simple pass to Higgins who you could tell was looking for an opening to shoot. However, he sensibly pulled the ball out to Shelvey on the right hand side of the box. With a lot of work still in front of him, Shelvey did exceptionally well to get past his marker and then find the bottom corner of the goal at the goalkeeper’s far post. Troon are not a bad side at all, but were simply being out-played in every position. However, they gave themselves a glimmer of light when substitute Pooler sped into the box with the ball and finished expertly to reduce the deficit. The Bankies didn’t panic and within a couple of minutes the three goal lead was restored. Stevie Higgins was the man who done the damage with a deserved goal. He received the ball on the left hand side of the box and he rolled the ball into the goal beyond Miller. Two minutes later and it was five. Jordan Shelvey was alert to some dithering between Keenan and Strachan in the centre circle. Shelvey prodded the ball beyond the two hapless defenders giving himself a clear run towards goal. This would have been a chance Shelvey would have missed a couple of years ago, but not anymore. He skilfully pushed the ball past the keeper for a great hat trick. What a position to be in. Five goals to one up with twenty minutes still to go. This is where the game management took over and the Bankies made their substitutions and skilfully ran the clock down without feeling particularly threatened again. It has to be said this was a quite fantastic display by the players. 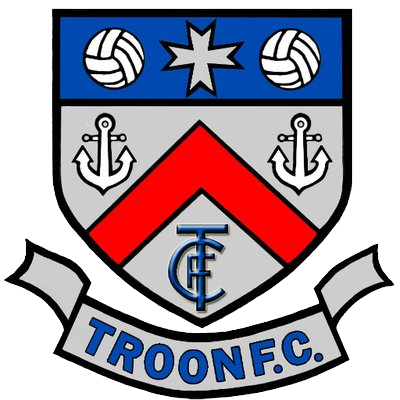 Troon are no mugs, but were made to look very ordinary. The points tally from the whole of last season has been surpassed already and the ambition is moving upward with every passing week. For me the best Bankies were Shelvey, Hepburn and Higgins who has upped his game drastically in the last two weeks. Liam Rowan shone as well as he completely dictated the midfield and never put a foot wrong. Next week is a break from the League as Glasgow Perthshire come to Lochburn Park in a match the Bankies will be looking to continue this run of form in.